The Medical Informatics Europe conference this year was in Pisa, Italy. I had been meaning to visit Pompeii ever since we passed it on our way to Sorrento in 2006, so I arranged to go to Italy a few days before the conference. We flew in through Naples, so our first stop was the Naples Archaelogical Museum*. Many of the best items recovered from Pompeii and Herculaneum are here. 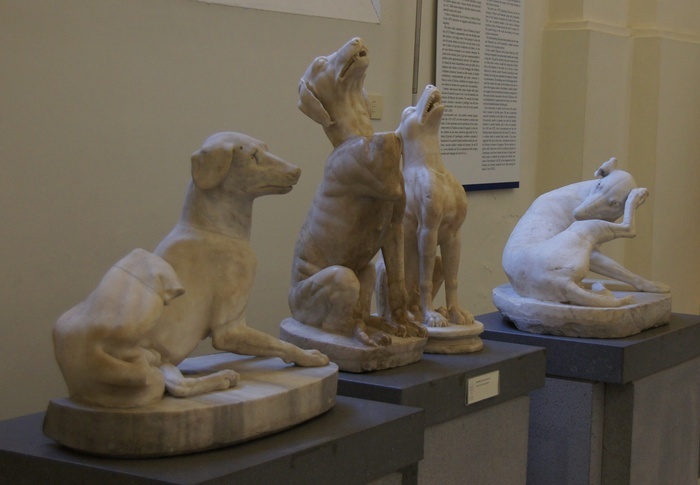 The label says statues from Imperial Rome, but I would call this group the itchy dogs. 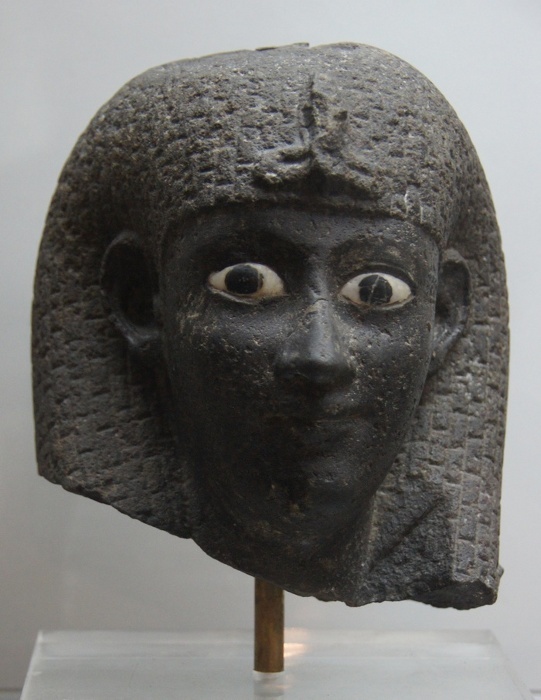 A pather from Imperial Rome, with painted eyes. 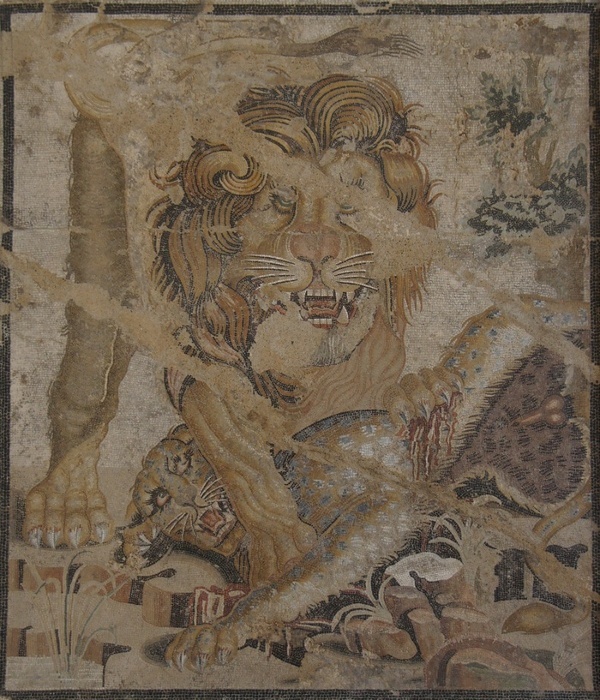 The lactating panther was an image often associated with Dionysus, and this one (and its match on the other side of the door) may have been made with that iconography in mind. A closer look at the head of its pair. The Farnese Bull, from the 2nd century AD. It is difficult to show its size in the photo, but this is the largest ancient sculpture ever recovered. 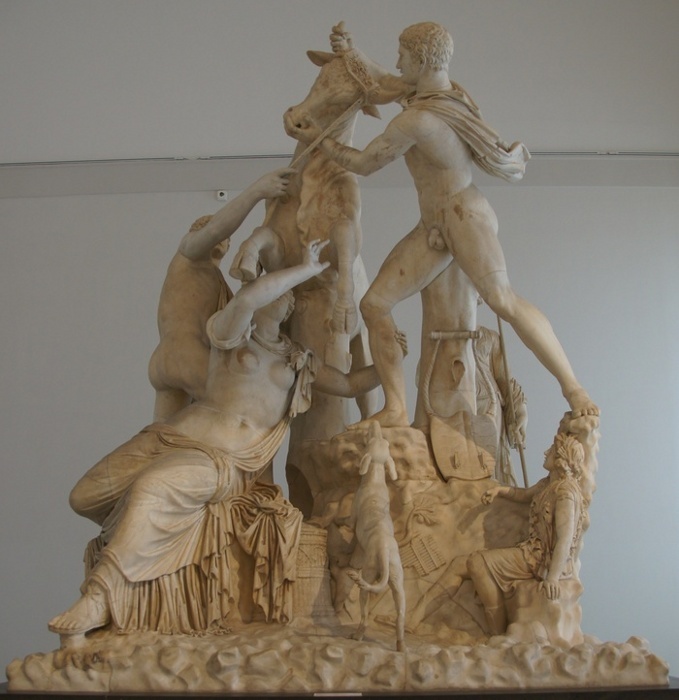 It depicts the legend of Dirce, who was entrusted to care for Antiope after she was impregnated by Zeus, and abused the girl until she finally escaped. When grown, her demigod children tied Dirce to a bull as punishment for her abuse of their mother. 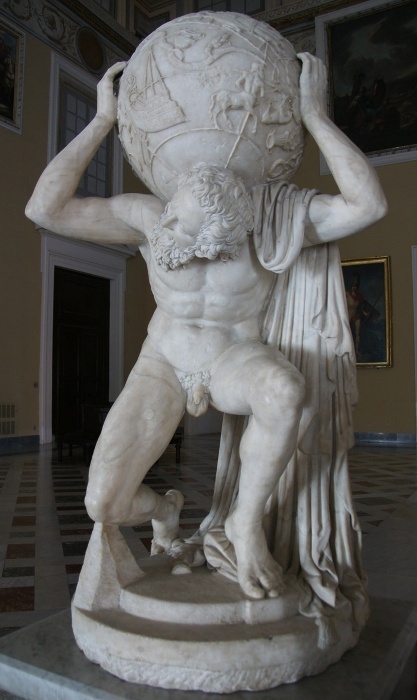 In the late 1500's, the sculpture was part of the collection of Alessandro Farnese (who later became Pope Paul III), which was eventually added to the national collections. Its whereabouts in the intervening centuries were not recorded. 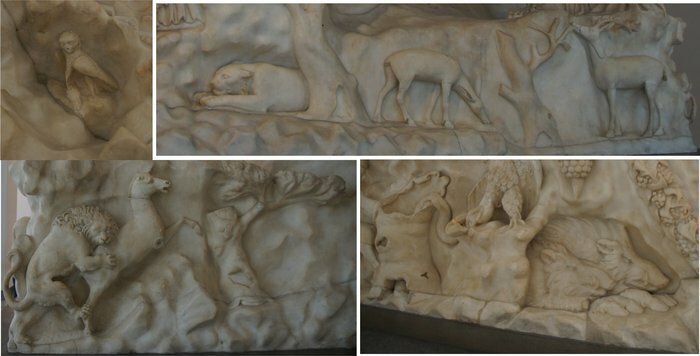 One of the best things about the piece, though, was the details of forest scenes - some peaceful, some less so - around the base. The Meridian Room was intended to be part of The Study, an enormous building including a library, designed in 1612. In 1790 an observatory was planned, but the only part of this to be completed was the solar meridian - a line tracing the path of the sun at midday throughout the year, decorated with the signs of the zodiac. 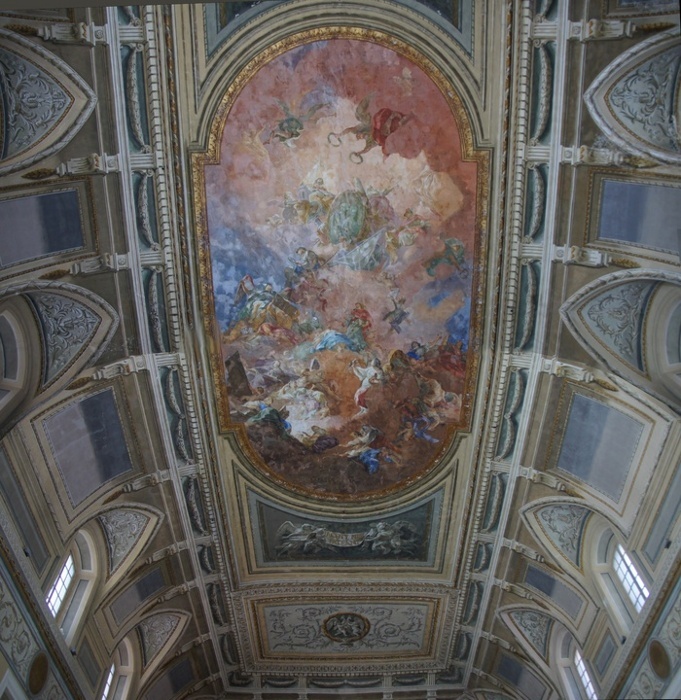 The painting on the ceiling had been added shortly before, in 1781. The Farnese Atlas is the oldest representation we have of a celestial map. The globe on his shoulders maps the constellations. This statue is from the 2nd century AD, although it is a copy of an original presumed to be from around 150 BC. I noticed that the Vatican was decorated with a lot of meta-art - paintings of columns, sculptures, and even framed paintings, often painted directly onto the wall. At the time I had no idea that they were hearkening to a 2000-year-old tradition. 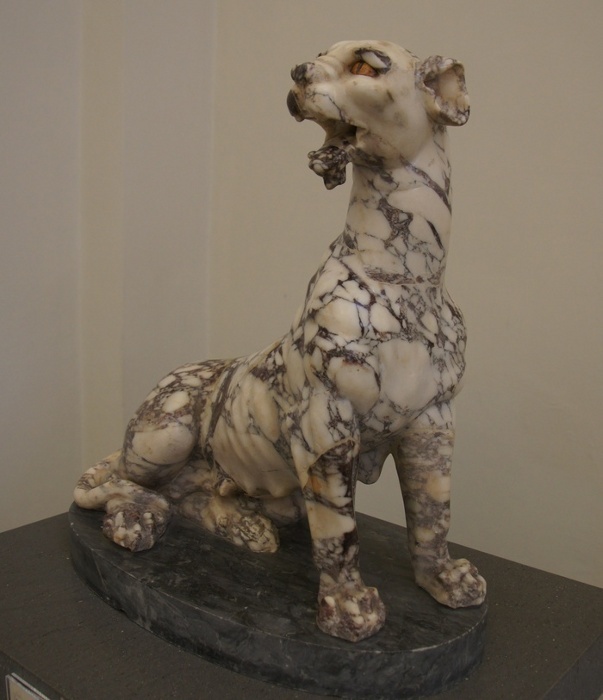 The earliest examples were just plaster painted to look like more expensive materials, such as marble. Painted columns started to show up around 100 BC, followed shortly by illusions of perspective, presumably to make the room feel more spacious. Other countries have historical sites and artifacts, Italy is nearly made of them. The notion of what to do with them has changed dramatically over the years. 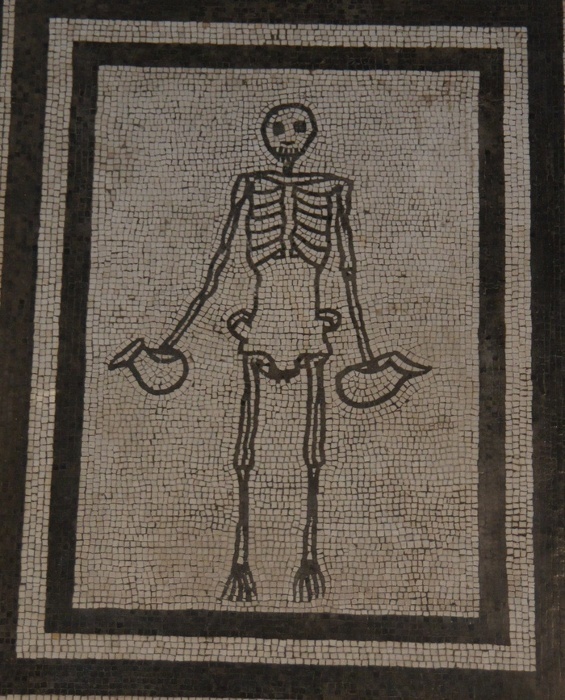 When Pompeii was first discovered, the best items were removed and sent to museums or private collections. 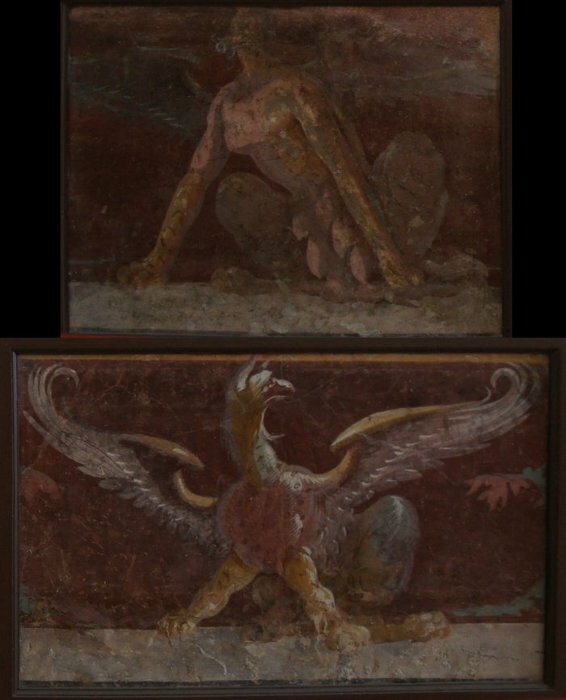 These small paintings sometimes accompanied the illusionary rooms above, but were also common in later works, from 40-60 AD. In these later works the illusion of depth disappeared, and the walls were divided by large borders surrounding a small central painting. 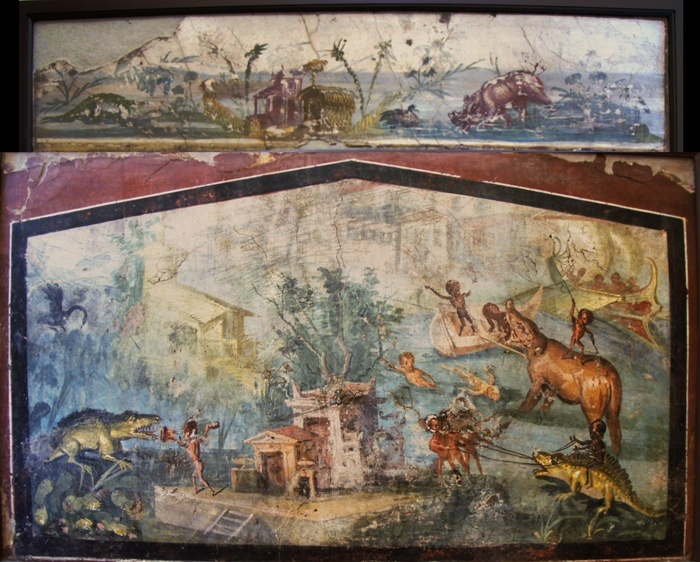 The illusion of depth returned around 60 AD, and was combined with paintings of framed figures, often connected visually by painted vines or draped cloth. This was still the height of Pompeiian fashion when Vesuvius rendered the latest fashion suddenly and terribly irrelevant. 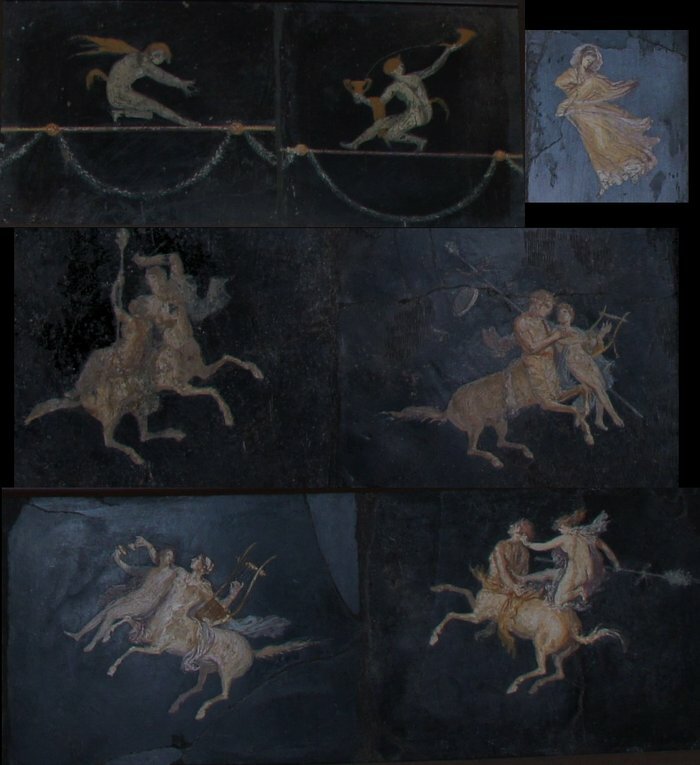 This group depicts acrobats, a flying figure, centaurs and centaurids (lady centaurs). I don't know why the figures are described as flying. Several sources use the name, none describe why they are flying more than other things painted without a backdrop. 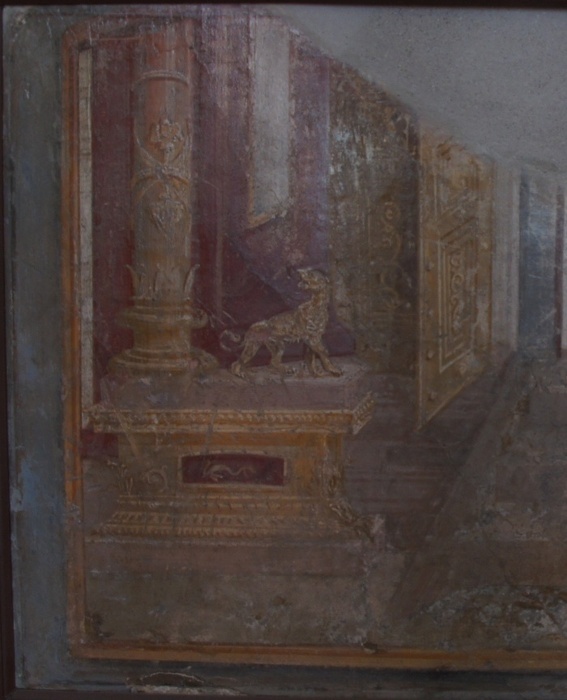 Frescos are painted by adding color to wet plaster. Plaster does not stay wet for long, thus frescos-in-progress are very rarely found. 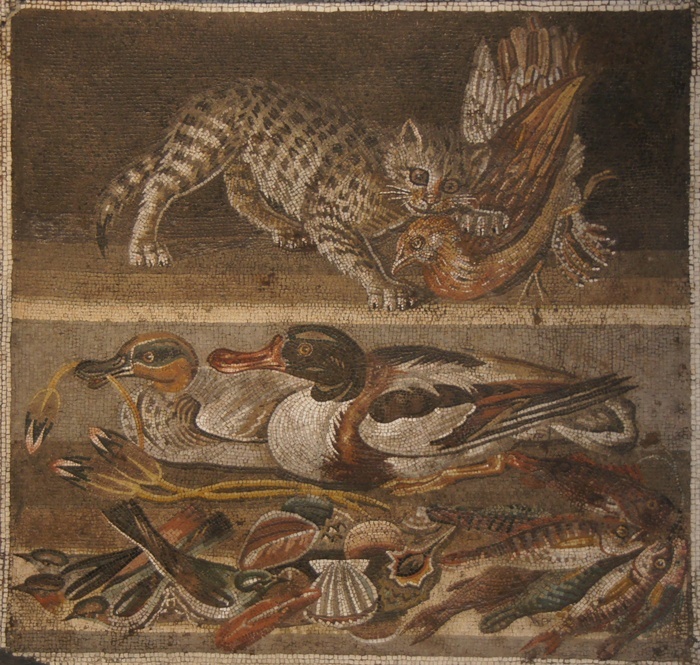 Pompeii is one of the places where you find them, along with plates of pigments dropped from the artist's hand as he fell or fled. 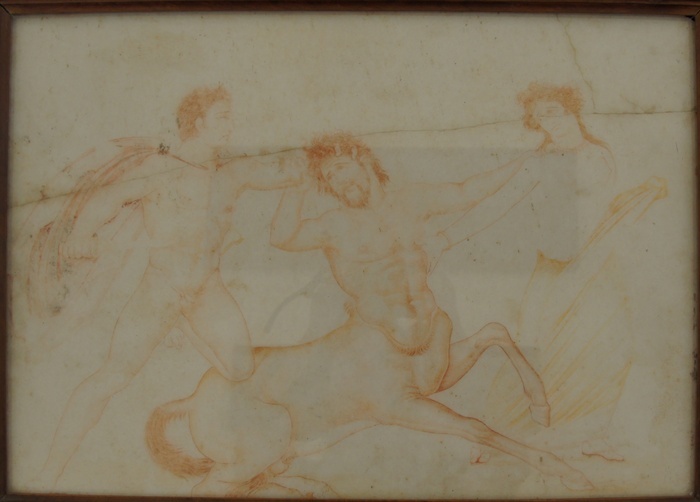 There was no sign accompanying this piece, but frescos were often sketched first in red pigment ( sinopia ), thus I think this is a sketch for a fresco that would have been painted in the next few days. Egyptian imagery was all the rage in Italy after Augustus defeated Cleopatra in 30 AD, and Egypt was annexed into the Roman empire. 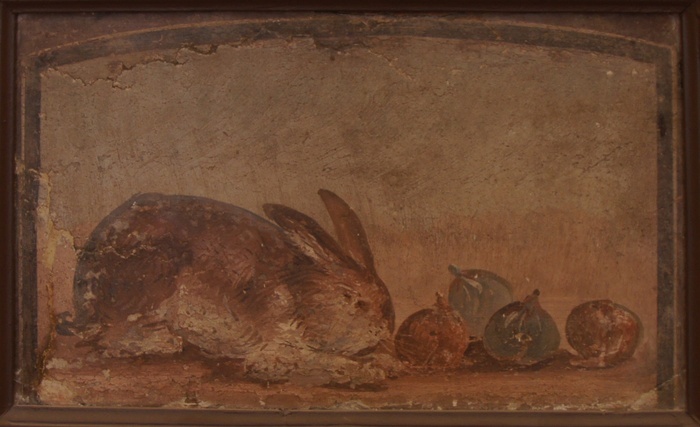 The museum says this is a rabbit with figs. Either they are very large figs or it is a very tiny rabbit. I think the above painting is less a pastoral scene than a serving suggestion, though, given the accompanying paintings. The first has birds (the sign says thrushes) and chanterelles, the second has birds and sliced spleen (well, okay, the sign says they are eels, but I think anyone who would eat one would probably not turn down the other). Another popular subject was pygmies - small, dark-skinned figures engaged in tropical pursuits, such as fighting crocodiles and towing dinosaurs. Homer wrote about pygmies in the Iliad in the 8th century BC, although it is not clear if this story refers to Indians or Africans. Herodotus refers to finding people of smaller than usual stature South of the Sahara. Interestingly, unlike the humans, the hippos are portrayed fairly realistically, including their nasty temperment - hippos are widely regarded as more dangerous than crocodiles in the Nile - and the top one looks about right, although it may have been slightly confused with a rhino. In my opinion, one of the most impressive mosaics, despite its violent theme. 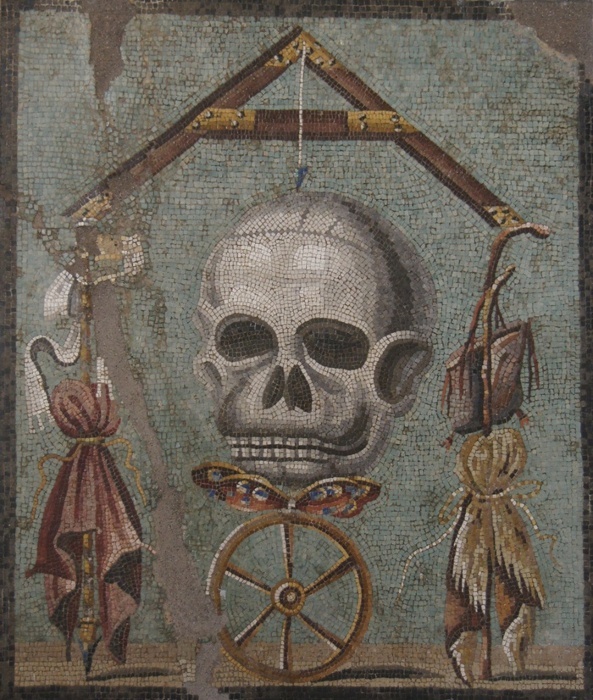 This is an allegorical piece: the level represents leveling of disparities between wealth and poverty, the skull represents mortality, the butterfly is the soul, the wheel is fortune. The items on the right are symbols of poverty, on the left are symbols of wealth. And, in case you're wondering, we don't have giant ear-holes in our skulls. 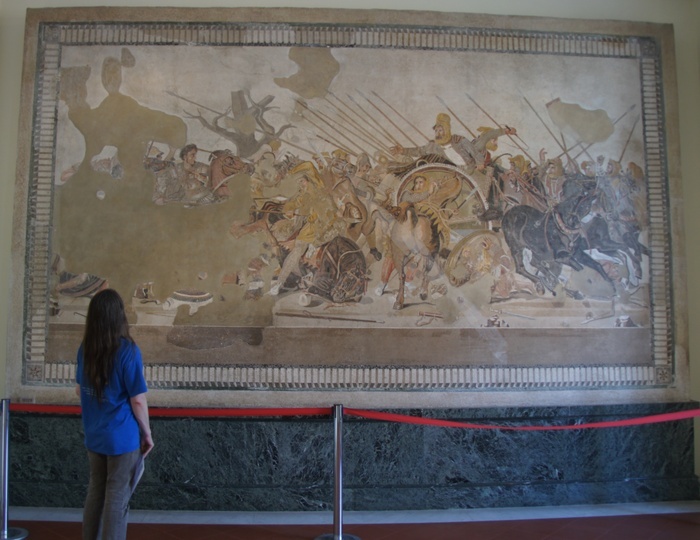 The mosaic of Alexander the Great battling Darius, king of the Persians, was originally in the House of the Faun in Pompeii. This work is from about 125 BC (and thus was about 200 years old when it was buried by Vesuvius), but is probably a copy of a 4th century BC Greek painting. Alexander rode a fameous war horse, Bucephalus. Legend has it that the horse could not be ridden, but the 12-year-old Alexander correctly observed that the horse was balking at the sight of its shadow, and by turning the horse so that it could not see its shadow, was able to mount and gentle it. Legend also says that the horse had five toes on each foot, and that because of this Julius Caesar also acquired and rode a polydactyl horse. This mosaic does not show Bucephalus as a polydactyl, but it also shows him as a brown horse, and he is known to have been black with a white star. 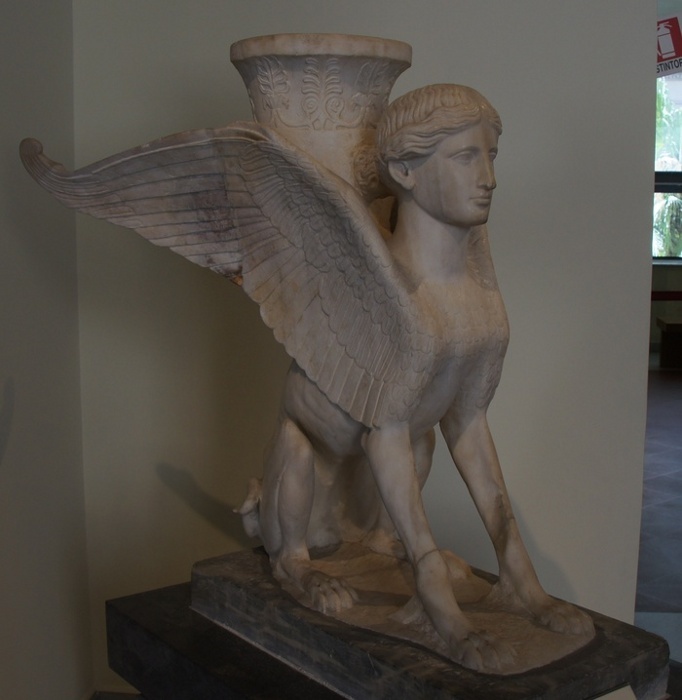 In Greek mythology, the Sphinx had the body of a lion, the wings of a bird, and the head of a woman. 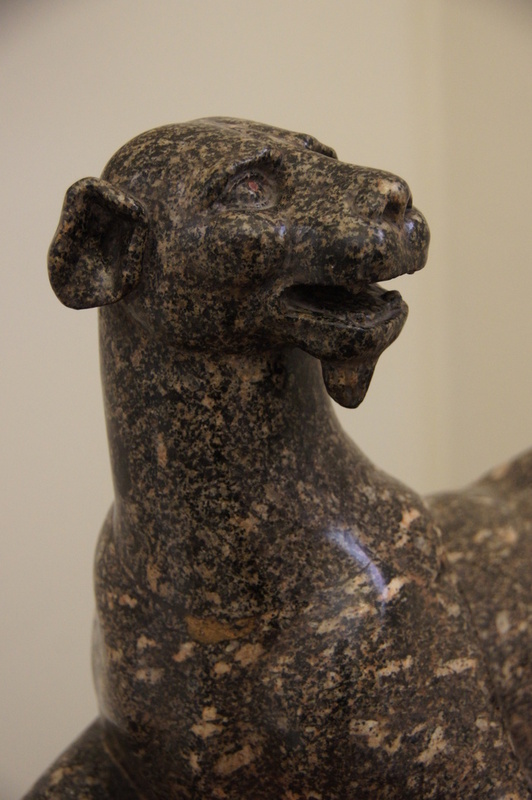 In Egypt, sphinxes could be male or female, and were guardians rather than the monsters of Greek mythology. 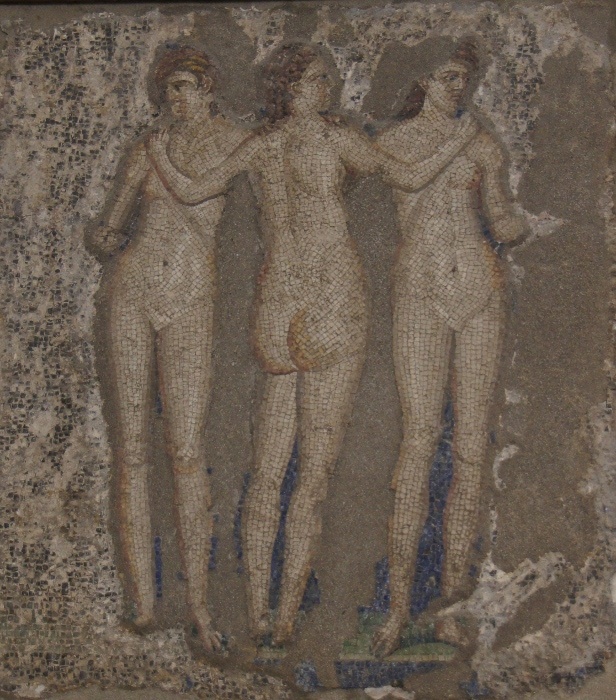 Mosaic of the Three Graces from the House of the Apollo in Pompeii. In Greek a grace was a Charis (plural Charities ). Exactly how many there were and what they represented changed between times and regions, but generally they represented things which give joy to people: beauty, good humor, and happiness. At various times they were associated with Dionysus, Hermes, or Apollo. 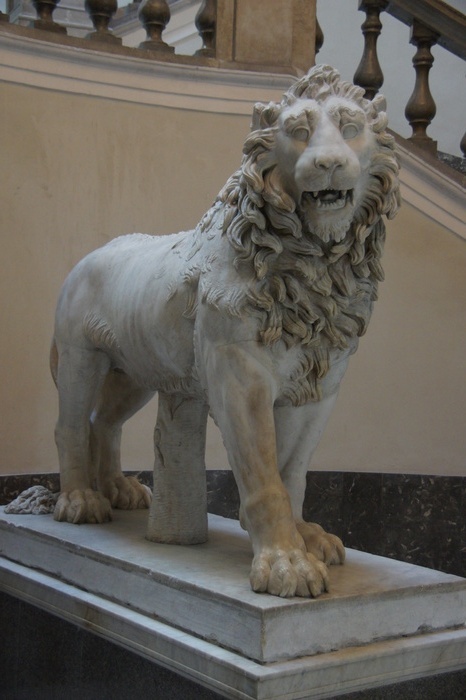 Lion funerary monument, 2nd century, now guarding the staircase in the museum. 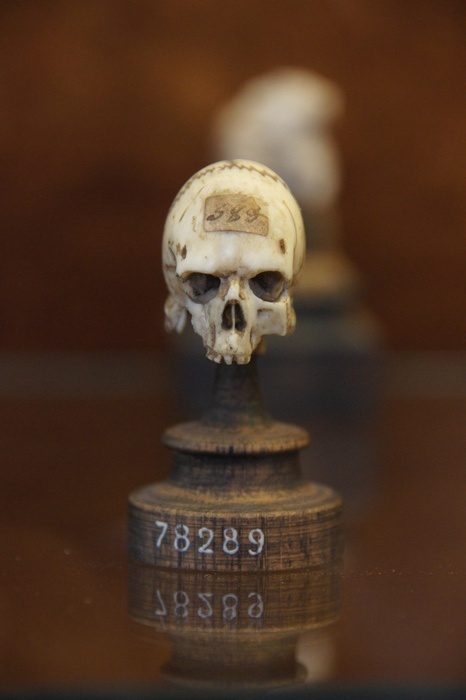 This carved skull was only about 3 cm tall. I don't know much more about it. The only reference I can find to the object names it as a death bead , but without any explanation of its use or significance. Some traditions go way back. 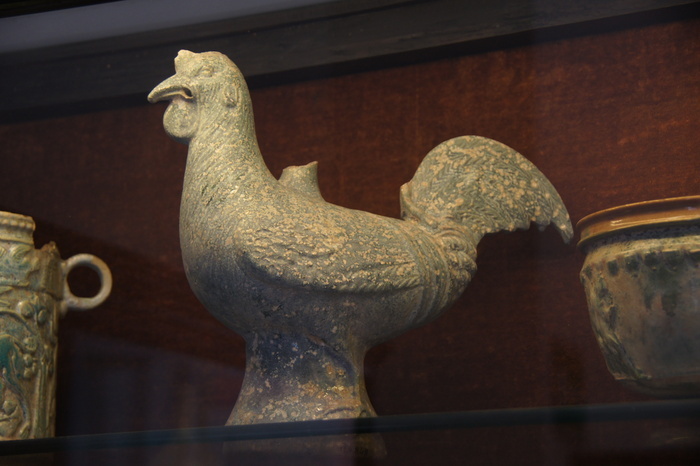 Ancient Romans gave gifts at the end of December, raised their wine glasses to drink to one anothers' health, and, apparently, decorated their homes with ugly green ceramic chickens. Perhaps it was meant to resemble a fancy breed of chicken (which do sometimes come in green), or perhaps when you are surrounded by centuries' worth of marble carved into curved and muscled bodies draped with translucent gowns that nearly seem to flutter in the wind, an ugly chicken is a welcome respite. Anyway, I'm pretty sure you can find a twin to this thing for sale on the back shelves of rural gas stations throughout the midwest. The Egyptian section was closed, but somehow King Ackamemnon the Easily Startled made it into the small collection on display. 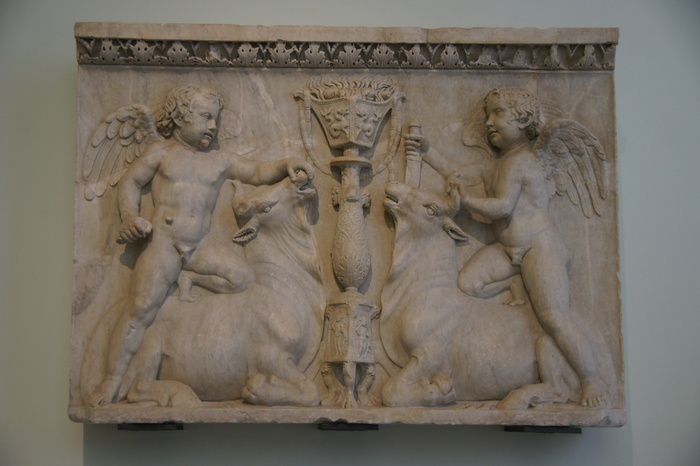 This second-century marble relief is labeled Cupids riding bulls, but to my eye it looks like their intent is a bit more violent than just riding them. The scene is reminescent of a tauroctony, the symbolic images of the cult of Mithras, which was very popular in Rome around the 3rd century (like this one from the Terme Diocleziano in Rome). I suspect this image is a crossover piece. 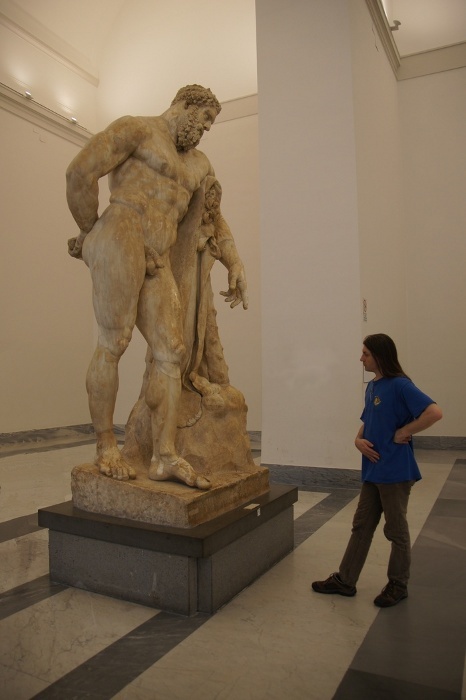 One of the most famous pieces in the Naples museum: the Farnese Hercules, from the Baths of Caracalla. It depicts Hercules resting after completing the last of his Tweleve Labors, his punishment for killing his six sons in a fit of madness. 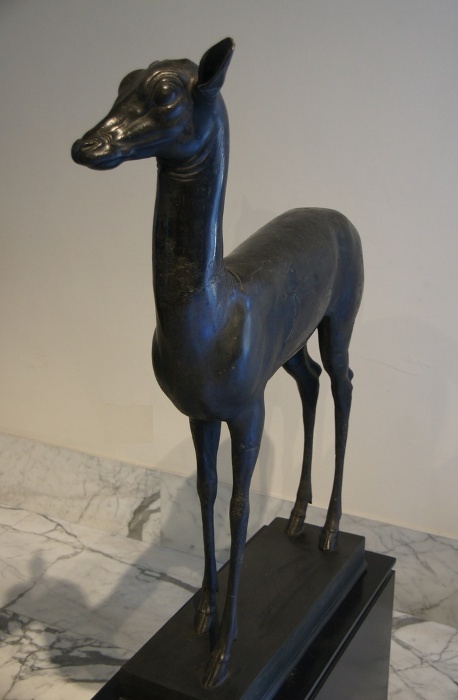 Bronze deer, not further described. *For anyone trying to follow the route: the Alibus departs right in front of the Arrivals hall at the Naples airport and goes to Naples Central Station (Garabaldi). From there we took the Metro line 2 one stop to Cavour, then followed the signs underground to line 1, which led us to the Museo metro stop right outside of the Naples Archaelogical Museum. Apparently they are working on extending Metro line 1 to connect directly to Naples Central Station. The Alibus cost 3 euros/person and the metro cost 1.20/person as of August 2012.